Made out of neoprene material and comfortably fit around your waist, experience sweet high flexibility and support during your workouts. · 3D three-dimensional cut: according to ergonomic design, the perfect fit waist. · Flexible fabric: to meet different groups of people, fat and thin, both men and women can wear. · Use super Velcro, waist size can be adjusted freely. · Sweat lining: Achieve the ideal fat dissolution temperature. · Maintain the skin moist: A lot of sweat during exercise can give the skin hydration, make the skin softer and more smooth. This waist belt with size 45.67'' * 9'', can fit any waist size up to around 56.3''. Perfect for increases your sweat volume and weight loss while you are doing any exercise such as running, Yoga, Fitness, Skipping, Hula Hoop, Aerobics and so on. ★ High Quality-- Adjustable and Stretchy Neoprene Fabric, Strong and Durable. feel delicate, soft, flexible, with shockproof, flexible, impermeable and breathable. you can wear it under any workout apparel. One Size fits Most, fits up to 56.3 inches. ★ Unique Design-- Strong Core: Strengthen, tighten and protect your core muscle. 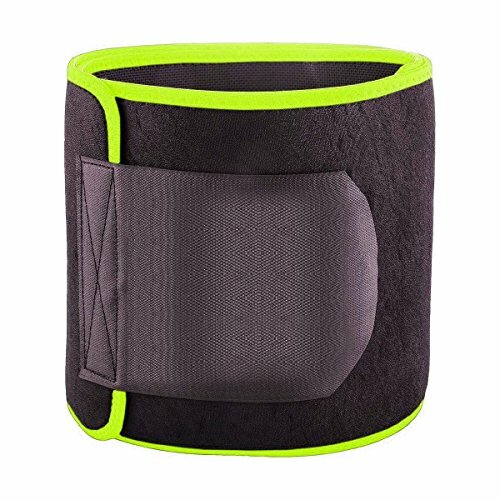 offers better balance, easier breathing, improved circulation and a healthy posture; Back Support: Provides compression to support your lower back and abdominal muscles. create the best posture for healing. ★ Promotes Weight Loss-- The best exercise equipment for abdominal muscle and is perfect for all kinds of workout. Maximize your burn and lose that belly fat fast by preserving body heat and removing excess water weight especially in your abdominal area. ★ Size & Compatibility-- Elastic Velcro straps adjust to any Size! Comfortable, and great to wear while working out. The size is 45.67'' * 9'' can fit almost any waist size up to around 56.3''. ★ Warranty -- 40-day money back guarantee, 18-month hassle-free warranty with friendly customer service. If you have any questions about this product by VOCH, contact us by completing and submitting the form below. If you are looking for a specif part number, please include it with your message.